The Old Foodie: How to Roast a Swan. Today in 1845 was the birthday of “Mad King Ludwig II” of Bavaria – officially, that is. In actual fact he had been born an hour earlier, in the dying moments of yesterday, but attendants at the birth – and his own mother – conspired to keep the real time a secret. The reason was that his grandfather, Ludwig I, had a wish that his new grandchild would share his own birthda. The decision to conspire in this deceit should give some indication of the state of the royal family dynamics at the time. Was Ludwig mad? Or bad? Or sad? Surely he was sad? – and perhaps made mad by the circumstances of his life. Might he have been an architect had he not been royal? The the fanciful fairytale castles that he instigated are huge tourist drawcards today. Or perhaps he might have been a musician, for he was passionately fond of music and was a long-time patron of Richard Wagner. Instead he was forced to be king, a king tortured by his own homosexuality – and one who was increasingly unlikely to be able to fulfil his primary kingly duty and provide an heir. His day to day behaviour was not bad - embarrassing to his family and officials, yes, but embarrassing is not the same as wicked. Much of his embarrassing behaviour centred round his dining habits. He ate at odd hours, at whim, often with imaginary guests and sometimes with his actual horse at the dining table. He loved riding, and often set off on imaginary journeys (around the riding pavilion), dismounting at his imaginary location where waiting staff spread a picnic meal on the ground. Perhaps he might have been a cook or restaurateur, in another life? Ludwig’s torture and the State’s embarrassment ended when he and his physician both “accidentally” drowned in a lake on June 13th 1886, three days after he was officially declared insane by a chief psychiatrist who had not examined him. Ludwig was also known as “The Swan King” for his great love of “The Monarch of the Lake”, and swan motifs are everywhere in his castles. We can be fairly sure he would never have eaten his favourite bird, but earlier rich and royal folk certainly did. 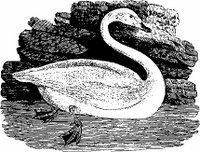 It was not enjoyed for its taste – which is said to be like “fishy mutton”, but because it was prestigious (certainly in England, all swans have officiallly belonged to the monarch since the twelfth century) and because it could be made into a spectacular centrepiece at the banquet. To do this of course required that the cooked swan be re-dressed in its plumage before being presented at table. In case you need to know how to do this, here is a recipe from the late fourteenth century “Le Menagier de Paris”. SWAN. Pluck like a chicken or goose, scald, or boil; spit, skewer in four places, and roast with all its feet and beak, and leave the head unplucked; and eat with yellow pepper. Item, if you wish, it may be gilded. Item, when you kill it, you should split its head down to the shoulders. Item, sometimes they are skinned and reclothed. RECLOTHED SWAN in its skin with all the feathers. Take it and split it between the shoulders, and cut it along the stomach: then take off the skin from the neck cut at the shoulders, holding the body by the feet; then put it on the spit, and skewer it and gild it. And when it is cooked, it must be reclothed in its skin, and let the neck be nice and straight or flat; and let it be eaten with yellow pepper. here in Tassie, swan used to be called glasgow goose (there were many variants I think) after it became illegal to catch swan.There is a large breed of goose called the swan goose, but these were definitely swan. Long time ago..haven't seen or heard of the glasgow for a long time. The upper reaches of the Derwent are full of swan though. Hello foodkitty. How fascinating! I've never heard the phrase "glasgow goose" before. There must be at least one story there for me. What is yellow pepper O.F.? Hello Sally. The author probably meant "Yellow Pepper Sauce" which was popular at the time. It did not contain pepper at all, but was "peppery" from ginger, and yellow from saffron. sometimes it had cloves in it. It was thickened with breadcrumbs and sharpened with vinegar or verjuice. Sounds OK to me. I think this blog needs a glossary! It's a very festive occasion, and colorful. And the spectators are fueled by beer, but no swan burgers. Hello Sam. I'd love to see the Swan Upping ceremony. They'd probably lock anyone up in the Tower of London for eating swan-burgers! Meat looks like venison , carves like beef ; tastes like tuna .